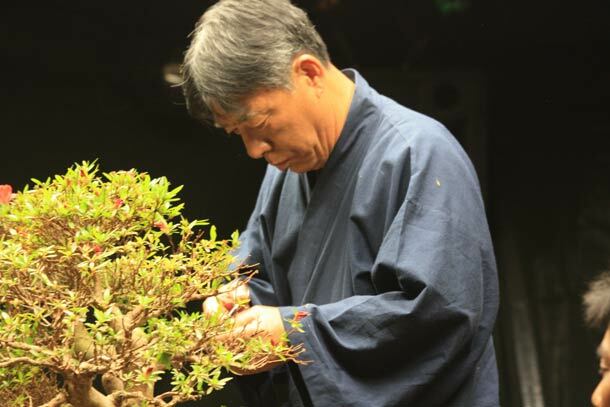 The S. Azalea he was working on had been pruned incorrectly historically; it appeared that it had only been worked on by tip pruning to maintain the overall aesthetic shape. Therefore the pads were not very healthy, they had lots of dead branches in the interior of them and lacked the structure required to maintain the shape long term. 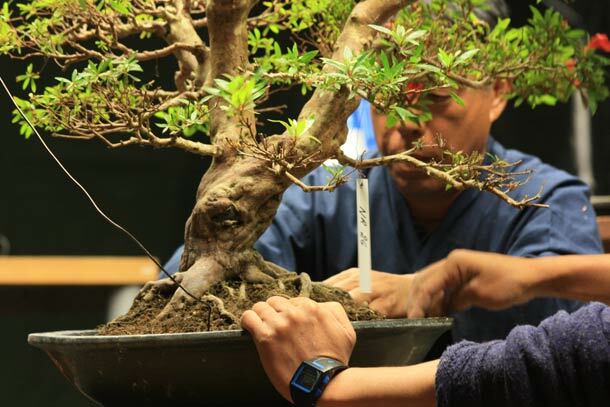 Therefore the whole tree needed to be re-worked to re-style and shape each of the pads and heavily prune them back to reduce the height of the pads and to re-invigorate the tree. He had already started to do this, and the effect was a much reduced crown density and in some instances, the branches where taken back only to leave two leaves or even no leaves. However caution with this approach in the UK, as humidity levels are not high enough to promote the re-growth, back budding from branch ends without foliage. Humidity levels need to be around 80% to allow this technique to work, which it does in Japan. I asked the interpreter how to overcome this for UK conditions and he suggested trying to create sauna type conditions but it would be hard so otherwise, if you did need to carry out a heavy re-structure, do it as a phased approach and put a humidity bag over the pad that has been re-structured to re-create higher humidity levels for that pad and await for that one to re-cover prior to working another. This should then encourage the back budding and flushing of new buds on cut branch ends. Misting also to raise humidity levels was also advised, but again a cautionary note as high humidity can lead to pest and disease problems so try not to let the branches become too damp that they become mouldy and be on the alert for pests. 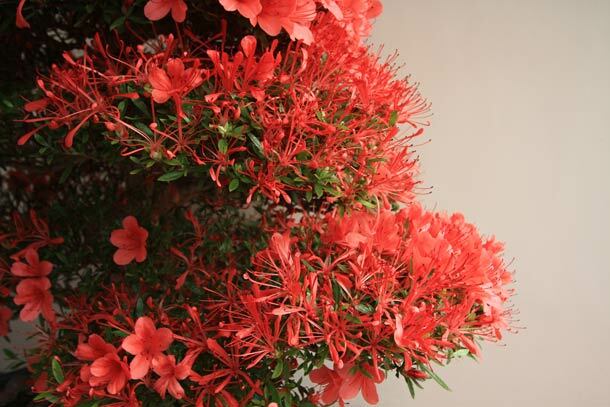 The S. Azalea being demonstrated upon was a red flowering Azalea which had very delicate dissected petals for the majority but some of the flowers were reverting back to the mother plant and becoming full in form with a compound shape. These types of flowers are less desirable but are the true form for the tree, and where they occur they should be removed to allow for the more desirable flowers which are weaker. This is typical and is called reversion. 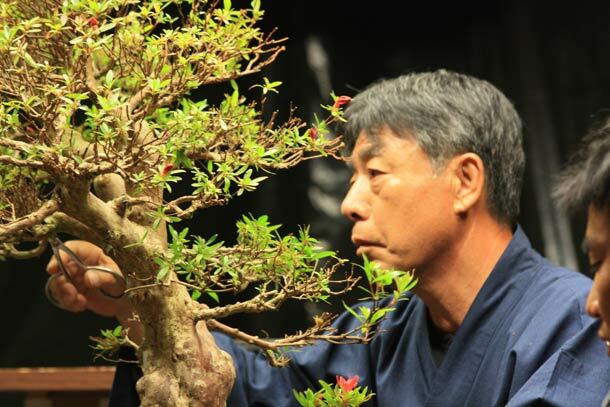 Mr Sekiyama then went on to re-pot the Azalea, it was not correctly wired into the pot as the wire had no tension but the size of wire used was correct. Also the wire shape was that of a ‘V’ and not a ‘T’ which is the correct formation for added stability for this pot and the wire hole positions. 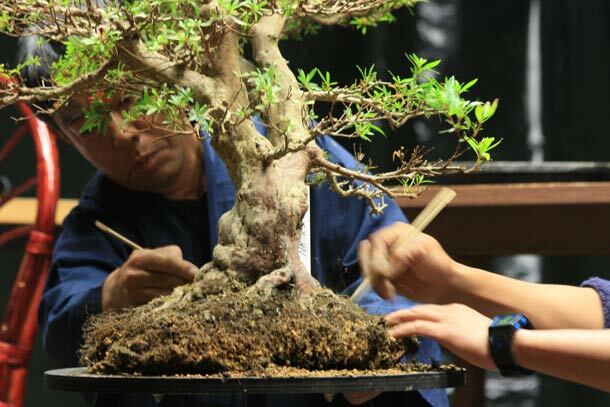 He recommends re-potting every 2-3 years but this would depend on the trunk thickness and how big the pot is. It is also important to keep a record of the re-potting dates and to do this, add a plant label to the pot once re-potting is complete with year of re-potting and also the soil used. 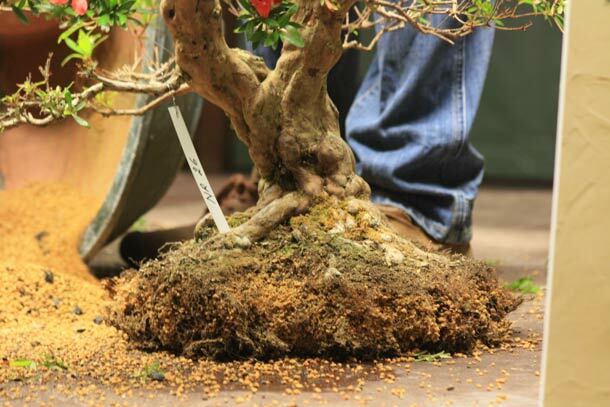 If the tree is not growing the reason for this is usually down to poor root development or root problems so you will need to re-pot sooner if this is the case. 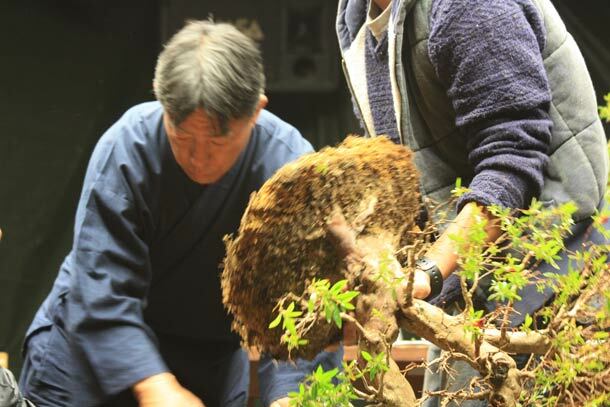 On removing the tree from the pot, one of the first things that Mr Sekiyama did was to smell the roots as this is a good indicator if there is a root problem as you can smell the roots rotting. It is a stale smell and you can also see them if they are rotten as they are black or brown. If the roots are rotting, then wash them and clean off the rotten sections prior to continuing to re-pot. 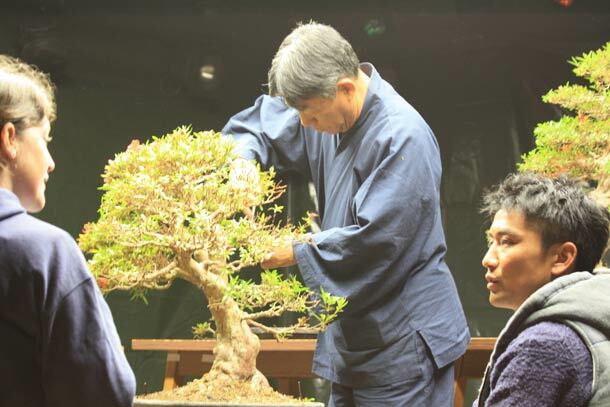 A note of caution, that field grown Pines in Japan tend to be potted up in their original soil, this is noy good, and this all should be removed once they are put into a bonsai pot, and remove any unwanted material too as this is sometimes left in also by mistake. 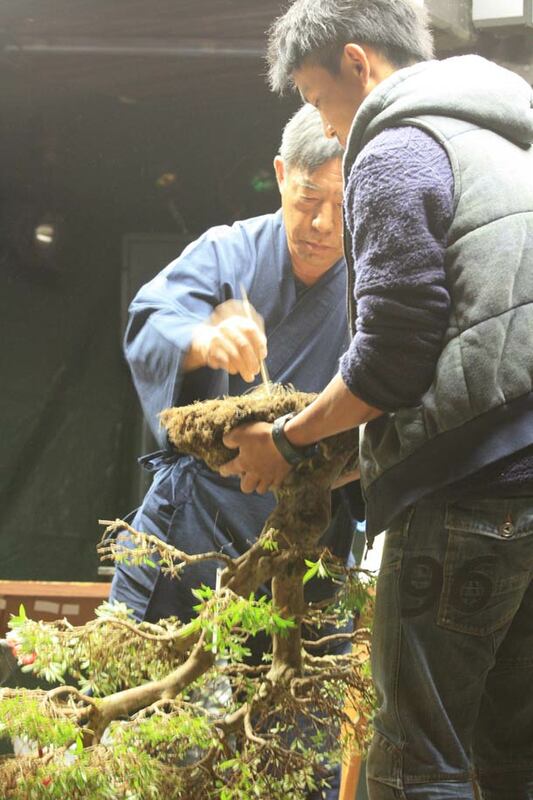 You can use a range of tools and the ones used in the demonstration where that of a root hook, and chop sticks to aid with removing the old kanuma. When re-potting it is important to have a drainage layer at the bottom of the pot which is made up of larger particles and this should be a light stone like pumice or kiryu. 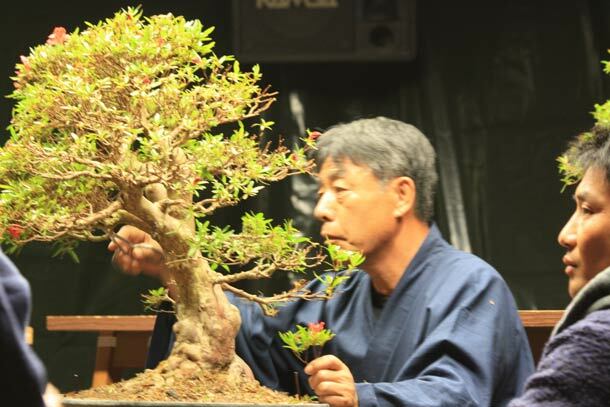 As this is an Azalea the selected growing medium was kanuma which is a volcanic rock from Japan. Depending on the size of tree will determine the particle size to use and as this is a large tree, the largest particle Kanuma was used. 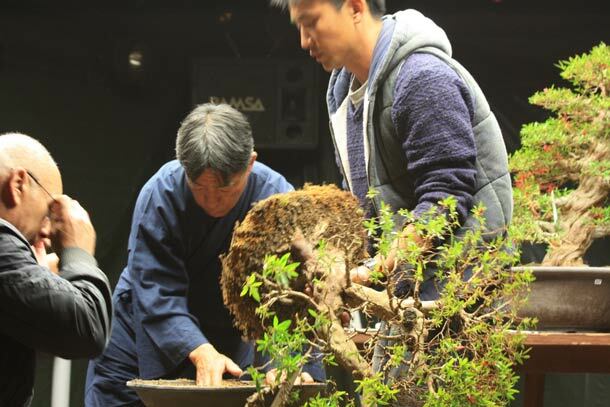 Kanuma contains dust so it should be sieved prior to use and then once it has been placed in the pot, and worked around the roots with a chop stick, the whole root area should be washed through so the fine dust particles are washed away. Continue washing through until the water is no longer yellow in colour. It is important to remove the fine particles as these reduce the air spaces between the particles which is where the fibrous roots will form and grow. However, the chop stick is used to aid with soil cohesion within the pot so avoid large air pockets as roots will not grow in these. Also tapping the side of the pot as you add the soil aids with helping it settle, but do not compact it down too much. Charcoal can be added to the soil mix, approximately 5% was recommended as this aids with moisture retention, as well as aids with cleaning the water as it passes through the soil and promotes beneficial bacteria for the roots. Mr Sekiyama also recommended the use of Bamboo Charcoal over that of normal charcoal as it seems to have more beneficial properties for the trees roots in the context of mycorrhizal fungi. If the bark has algae on, then clean it with a wire brush but be careful as Azalea tend to be thin barked and otherwise use a tooth brush. There was a lot more discussed as part of the demonstration and it was great that there was an interpreter present to translate from Japanese to English. 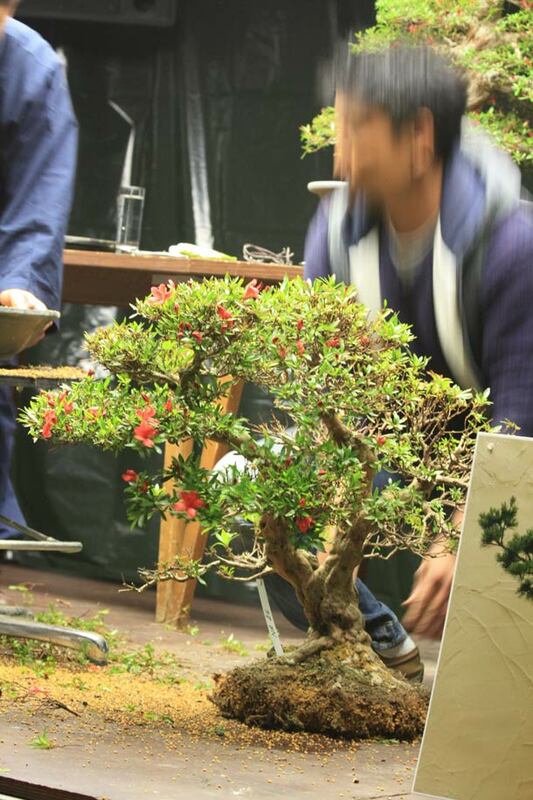 So overall it was a very informative and useful demonstration, and great to have the chance to be there and learn more about Azaleas. Posted June 7, 2012 by AW & filed under General Interest.